Poemdrum. Laser cut mild steel, anodized aluminium, two motor turntable assembly with light. Text is a fragment from Homage to the Space Pioneers, a poem by Sinclair Beiles, given to the artist in 1960. 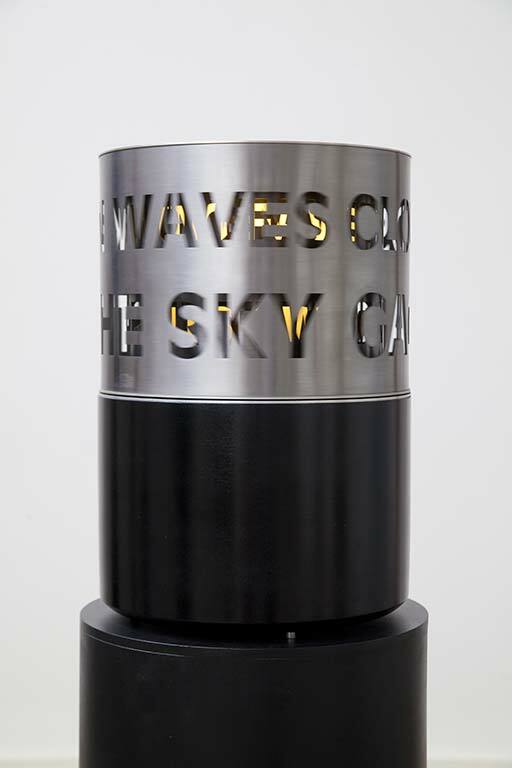 This work is the first in a series of layered nested texts, where light and movement both inhibit and allow the viewer to comprehend the meaning contained in the sign. Lijn intends these works to be about the process of reading and about the even more fundamental process of focusing and changing of focus. Sinclair Beiles was a great South African Beat poet, both friend and editor of William S. Burroughs, whom Lijn met in Paris in 1959. He was the first man in space, launched there by Takis in the Iris Clert Gallery: The impossible: man in space in 1960. He hovered 2 metres above the floor held there by magnets, while he recited. his magnetic manifesto: “I am a sculpture…I would like to see all nuclear bombs on Earth turned into sculptures. Sinclair also suffered from a schizophrenic mental disorder that fragmented both his life and his crystal clear vision into painful splinters of both darkness and light. In Faster Than Birds, Lijn has fragmented even more the short fragment of text he gave her by laser cutting it onto three drums, each nested inside the other. Each drum is also rotating at both a different speed and opposite direction to the others. Words and letters, illuminated from within, become dislocated, in an interplay of meaning and light.